The specific power deposited in plasma under on-axis electron-cyclotron resonance heating (ECRH) is characterized by strong peaking, resulting in large-amplitude sawtooth oscillations. 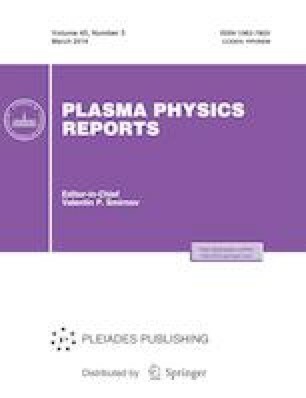 To analyze the global properties of plasma, instantaneous experimental profiles of the electron temperature should be averaged over time and space. In the present work, a modified canonical profile transport model for predictive calculation of such averaged profiles is proposed. As an example, the model is used to determine the parameters of plasma with ECRH in the T-15MD tokamak currently under construction. The authors are grateful to L.G. Eliseev for an additional software alleviating the use of the ASTRA code and D.A. Kislov for providing us with the T-10 data. The T-10 experiments were supported by Rosatom, contract no. 1/15470-D/230/1040-18. This work was also supported in part by the Russian Foundation for Basic Research (projects nos. 17-07-00544 and 17‑07-00883) and the Russian Science Foundation (project no. 14-22-00193).